Abigail Kathleen Breslin (born April 14, 1996) is an American actress and singer. She appeared in her first commercial when she was three years old, and in her first film, Signs (2002), at the age of five. Her other film roles include Little Miss Sunshine (2006), for which she was nominated for the Academy Award for Best Supporting Actress, No Reservations (2007), Nim's Island (2008), Definitely, Maybe (2008), My Sister's Keeper (2009), Zombieland (2009), and Rango (2011). In September 2015, she began acting in the horror-comedy Scream Queens on Fox, in which she has her first regular role on a television series. Breslin also starred in the film adaptation of Orson Scott Card's novel, Ender's Game The film received mixed-to-positive reviews from critics but it was a disappointment at the box office, grossing only $125 million worldwide from a $110 million budget. In July 2012, she was cast in August: Osage County, the film adaptation of the Pulitzer Prize-winning play of the same name, alongside Julia Roberts, Benedict Cumberbatch, and Meryl Streep. August: Osage County received mostly positive reviews. In 2014, Breslin appeared in the crime drama Perfect Sisters. In January 2015, she was cast in the first season of Fox's horror-comedy anthology series Scream Queens. ↑ Zekas, Rita (July 27, 2007). "Abbie shines". Toronto Star. Archived from the original on December 8, 2015. Retrieved August 20, 2012. ↑ DeMara, Bruce (June 26, 2009). "Family strife lets Abigail Breslin show serious side". Toronto Star. Retrieved March 13, 2010. ↑ Academy of Motion Picture Arts and Sciences (March 2008). "Oldest/Youngest Winners and Nominees for Acting, By Category". Awards Database. oscars.org (AMPAS). Retrieved February 1, 2014. Statistics are valid through the 2007 (80th) Awards, presented on February 24, 2008. [document last updated 3/08] ... (* indicates a win). ↑ Rosenabigails, Steve (March 11, 2007). "It's our job to tell kids about work". The Kansas City Star. Retrieved March 12, 2007. ↑ "Spencer Breslin profile at FilmReference.com". Retrieved June 29, 2015. 1 2 Todd, Jennifer (February 26, 2007). "Proud couple watches granddaughter at Oscars". Lancaster Online. Archived from the original on March 25, 2007. Retrieved March 12, 2007. ↑ Breslin, Abigail (February 25, 2007). "The things they say". Contact Music. Retrieved March 12, 2007. ↑ Zekas, Rita (July 27, 2007). "Abbie shines on". Toronto Star. Retrieved March 13, 2010. ↑ "Signs Movie Reviews, Pictures". Rotten Tomatoes. Archived from the original on February 10, 2010. Retrieved March 10, 2010. ↑ "Signs (2002)". Box Office Mojo. Archived from the original on April 16, 2010. Retrieved March 10, 2010. ↑ Clinton, Paul (August 1, 2010). "'Signs' a thrilling ride". CNN. Retrieved March 10, 2010. ↑ Travers, Peter (August 2, 2010). "Signs". Rolling Stone. Retrieved June 14, 2011. ↑ Ansen, David (August 5, 2002). "Families, Fear And Faith". Newsweek. Retrieved March 10, 2010. ↑ "Raising Helen Movie Reviews, Pictures". Rotten Tomatoes. Retrieved March 10, 2010. ↑ "Keane (2005)". Box Office Mojo. March 10, 2010. Retrieved June 29, 2015. ↑ Morris, Wesley (September 30, 2005). "A vivid look at an unraveling mind". Boston Globe. Retrieved March 10, 2010. ↑ Atkinson, Michael (August 30, 2005). "Close Encounter". The Village Voice. Retrieved March 10, 2010. ↑ Keane, Meghan (September 9, 2005). "Keane". The New York Sun. Retrieved March 10, 2010. ↑ Gullién, Michael (July 20, 2006). "Little Miss Sunshine: Interview With Valerie Faris and Jonathan Dayton". Twitch. Retrieved March 10, 2010. ↑ Puig, Claudia (December 21, 2006). "Abigail: 'Little Miss Sunshine' highlights her winning ways". USA Today. Retrieved March 12, 2007. ↑ "Little Miss Sunshine (2006)". Rotten Tomatoes. Archived from the original on August 30, 2008. Retrieved August 28, 2008. ↑ "Little Miss Sunshine (2006)". Box Office Mojo. Archived from the original on March 2, 2010. Retrieved March 10, 2010. ↑ Rooney, David (January 21, 2006). "Little Miss Sunshine". Variety. Retrieved March 11, 2010. ↑ Stevens, Dana (July 25, 2006). "Little Miss Can't Be Wrong". Slate. Retrieved March 11, 2010. ↑ Puig, Claudia (December 21, 2006). "These kids are golden". USA Today. Retrieved March 10, 2010. ↑ Coyle, Jake (January 23, 2007). "Lil' Oscars: Breslin, 10, Wins Nom". The Washington Post. Retrieved March 11, 2010. ↑ "highlights of the 79th annual academy awards". MTV. Retrieved June 28, 2013. ↑ Gray, Iain (October 31, 2007). "Rachel Weisz transformed into Snow White". The Daily Telegraph. UK. Retrieved March 13, 2010. ↑ Zap2It.com (February 28, 2007). "Olsens top young rich list". JAM! Movies. Archived from the original on June 4, 2008. Retrieved August 22, 2016. ↑ "No Reservations Movie Reviews, Pictures". Rotten Tomatoes. Archived from the original on April 23, 2010. Retrieved March 10, 2010. ↑ "No Reservations (2007)". Box Office Mojo. Archived from the original on March 23, 2010. Retrieved March 10, 2010. ↑ Ebert, Roger (July 27, 2007). "No Reservations". Chicago Sun-Times. Retrieved March 10, 2010. ↑ "Definitely, Maybe Movie Reviews, Pictures". Rotten Tomatoes. Archived from the original on January 3, 2010. Retrieved March 12, 2010. ↑ Rea, Steven (February 14, 2008). "Witty, tender, definitely cute". The Philadelphia Inquirer. Retrieved March 12, 2010. ↑ Greenblatt, Leah (April 9, 2008). "Nim's Island (2008)". Entertainment Weekly. Retrieved March 12, 2010. ↑ "Nim's Island Movie Reviews, Pictures". Rotten Tomatoes. Retrieved March 12, 2010. ↑ "Nim's Island (2008)". Box Office Mojo. Retrieved March 12, 2010. ↑ Roberts, Sheila. 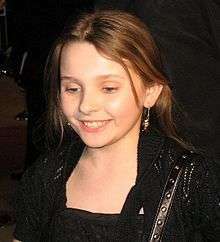 "Abigail Breslin Interview, Kit Kittredge An American Girl". MoviesOnline.com. Retrieved March 12, 2010. ↑ "Kit Kittredge: An American Girl". Rotten Tomatoes. Retrieved March 12, 2010. ↑ "Kit Kittredge: An American Girl (2008)". Box Office Mojo. Retrieved March 12, 2010. ↑ Puig, Claudia (July 3, 2008). "Spunky 'Kit' has kaboodles of charm". USA Today. Retrieved March 12, 2010. ↑ Stein, Ruthe (July 2, 2008). "Movie review: Little miss 'Kit Kittredge'". San Francisco Chronicle. Retrieved March 12, 2010. ↑ Morgensten, Joe (June 20, 2008). "'Kit Kittredge' Is a Rare Gift For Young Girls". The Wall Street Journal. Retrieved March 12, 2010. ↑ Fleming, Michael (October 24, 2007). "Fanning sisters set for 'Keeper". Variety. Retrieved March 20, 2010. ↑ Fleming, Michael (February 12, 2008). "Breslin, Vassilieva to star in 'Keeper". Variety. Retrieved March 20, 2010. ↑ "My Sister's Keeper Movie Reviews, Pictures". Rotten Tomatoes. Archived from the original on October 22, 2010. Retrieved October 10, 2010. ↑ "My Sister's Keeper (2009)". Box Office Mojo. Archived from the original on March 24, 2010. Retrieved March 13, 2010. ↑ Berardinelli, James (June 26, 2009). "My Sister's Keeper". ReelViews. Retrieved March 13, 2010. ↑ "Abigail Breslin Wants to Take on Darker Roles". BloodyDisgusting. ↑ Rich, Katey (September 29, 2009). "Exclusive Interview: Zombieland Director Ruben Fleischer". Cinema Blend. Retrieved March 15, 2010. ↑ "Zombieland Movie Reviews, Pictures". Rotten Tomatoes. Archived from the original on April 11, 2010. Retrieved March 13, 2010. ↑ "Zombieland (2009)". Box Office Mojo. Archived from the original on March 30, 2010. Retrieved March 13, 2010. ↑ "Sunshine star in Broadway debut". BBC News. October 29, 2009. Archived from the original on March 5, 2012. Retrieved October 29, 2009. ↑ "A Day in the Life of Abigail Breslin". Playbill. March 9, 2010. Retrieved October 22, 2010. ↑ Rust, Katharine. "Things to Do". Time Out New York. Archived from the original on March 25, 2010. Retrieved March 13, 2010. ↑ Healy, Patrick (October 29, 2009). "Advocacy Group Opposes 'Miracle Worker' Casting Choice". The New York Times. Archived from the original on November 17, 2010. Retrieved October 22, 2010. ↑ Healy, Patrick (December 8, 2009). "Vision-Impaired Girl Gets Helen Keller Understudy Role". The New York Times. Retrieved October 22, 2010. ↑ Gardner, Elysa (March 3, 2010). "Language a barrier for 'Miracle Worker,' but young stars shine". USA Today. Retrieved March 13, 2010. ↑ Kuchwara, Michael (March 3, 2010). "The battle for Helen Keller remains compelling". Associated Press. Retrieved March 13, 2010. ↑ Brantley, Ben (March 4, 2010). "Taming a Child by Setting Her Free". The New York Times. Archived from the original on March 16, 2010. Retrieved March 18, 2010. ↑ Scheck, Frank (March 3, 2010). "The Miracle Worker – Theater Review". The Hollywood Reporter. Retrieved October 22, 2010. ↑ Gamerman, Ellen (March 8, 2010). "'Miracle Worker' on B'way May Shutter". The Wall Street Journal. Retrieved March 13, 2010. ↑ Gans, Andrew (March 28, 2010). "The Miracle Worker Will Go Dark; Final Broadway Performance Is April 4". Playbill. Archived from the original on March 31, 2010. Retrieved March 31, 2010. ↑ "Abigail Breslin, Mira Sorvino, Peter Fonda movies filming in Des Moines", Des Moines Register. Retrieved June 29, 2015. 1 2 "2010 Films – Janie Jones". tiff.net. Archived from the original on December 2, 2010. Retrieved October 21, 2010. ↑ "Little miss big star: 'Rango' actress Abigail Breslin stays grounded on her Manhattan home turf". Daily News. New York. March 5, 2011. Retrieved January 19, 2012. ↑ "The Call". Rotten Tomatoes. Retrieved March 16, 2013. ↑ Barker, Andrew (March 11, 2013). "Film Review: 'The Call'". Variety. Retrieved March 16, 2013. ↑ "The Call (2013)". Box Office Mojo. Retrieved December 11, 2013. ↑ Vary, Adam B. (December 21, 2011). "Harrison Ford, Abigail Breslin set to play 'Ender's Game'". Entertainment Weekly. Retrieved December 31, 2011. ↑ "Ender's Game (2013)". Rotten Tomatoes. Retrieved December 25, 2013. ↑ Mendelson, Scott (December 20, 2013). "Box Office Catch-Up: 'Escape Plan' Huge In China, 'Ender's Game' Flops Everywhere". Forbes. Retrieved December 14, 2013. ↑ "Ender's Game (2013)". Box Office Mojo. Retrieved June 30, 2014. ↑ Patten, Dominic (July 19, 2012). "Abigail Breslin Heading To 'August: Osage County'". Deadline.com. Retrieved August 1, 2012. ↑ "August: Osage County (2013)". Rotten Tomatoes. Retrieved January 19, 2014. ↑ "Lea Michele, Joe Manganiello, More Join Ryan Murphy's 'Scream Queens'". The Hollywood Reporter. January 17, 2015. Retrieved January 18, 2015. ↑ "33rd Annual Young Artist Awards". YoungArtistAwards.org. Retrieved April 7, 2012.